In the past, buy-side firms had to purchase and integrate separate Order Management Systems (OMS) and Execution Management Systems (EMS), often from different vendors. This increased operational risk and system maintenance costs, limited trader productivity, and failed to capture critical data across the trade life cycle. Charles River solved this problem by creating a multi-asset Order and Execution Management System (OEMS) complete with data, FIX connectivity, Transaction Cost Analysis (TCA) and trade analytics. 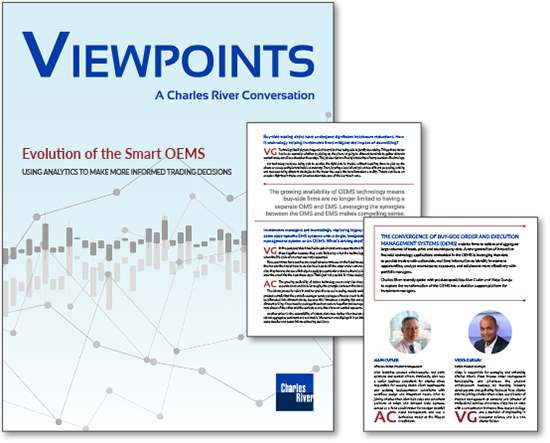 As part of the Charles River IMS, the OEMS provides traders with extensive decision support, streamlined workflows across asset classes and a rich repository of historical trade, order and counterparty data.